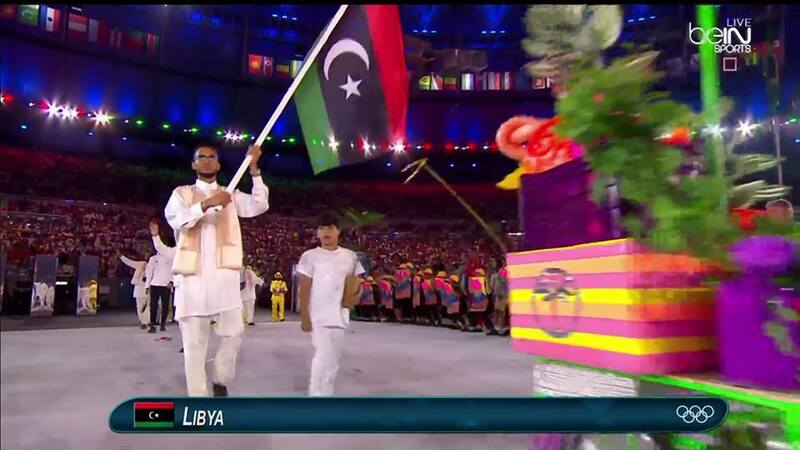 Marathon runner and US resident Mohamed Hrezi had the honour of carrying the Libyan flag at the Rio Olympics’ opening ceremony followed by the rest of the 6-member Libyan team (Photo: Social media). 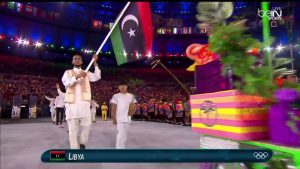 Libya’s small Olympic contingent of seven athletes proudly took part in the Rio 2016 opening ceremony (last night) early this morning. Despite all the political and economic problems that Libya is currently going through, seven members, six men and one solitary female swimmer, made it to the Rio games. Libya Herald has already featured Libya’s sole female and youngest Olympiad, Daniah Hagul, who has had to struggle on her own, thanks to her dedicated parents and support from family, friends and fans who have helped to raise funds for her through her crowdfunding efforts. She is studying in England while her family have been forced to live in Malta during Libya’s troubles to enable her to train on the Mediterranean island. Libya Herald would like to take this opportunity to thank all those who contributed to her crowd funding efforts earlier this summer and helped her achieve her needed target. Mohamed Hrezi, the marathon runner is another member of the team who lives and trains abroad. He has had to endure the pain of training this summer while fasting during the holy month of Ramadan. The 24-year-old student is starting a full-time MBA at Michigan State University in the USA, this autumn. He has been awarded the honour of carrying the Libyan flag. Libya Herald would like to take this opportunity to wish all seven Libyan athletes the best of luck in Rio and hope that they can provide hope and inspiration to the millions of Libyans back home.